Mountain living is definitely spectacular from this single family home. 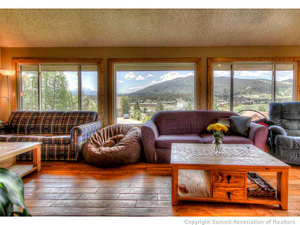 Located in Dillon, this house offers both gorgeous views and plenty of well-designed space for you and your family. There are 4 bedrooms and even a bonus room so you’ll never feel crowded. This home comes equipped with 2.5 baths that are recently remodeled, too. Plus, you’ll find authentic wood and tile floors throughout the home. Also, you can enjoy multiple decks that show off scenic Lake Dillon and the surrounding mountains. Furthermore, the living area overlooks mountain scenes and has beautiful vaulted ceilings. Additionally, this Dillon house has a large, fenced-in backyard with a fire pit and a gate to provide you with quick trail access. In short, I can’t say enough great things about this property. It’s a real gem in Summit County. Dillon stands out from other towns because it is built along the shores of the reservoir. So residents are always free to take advantage of the fabulous lake and mountain views, especially in the warmer months. The Dillon Marina and the Tiki Bar are very popular areas in the town. Free concerts and farmers markets by the lakefront make Dillon a huge attraction for residents and tourists alike. Dillon truly has a lot of wonderful qualities. You’ll find there is much to discover when you move into this town. If you’d like to know more about Dillon, I’m happy to provide you with further information on any of your areas of interest. Also, if you want to visit the Dillon house profiled in this blog, just let me know. I can arrange a tour on your schedule. Please be aware that I’m available to help you view other Summit County properties. Feel free to check out my website for updated listings of different types of homes that are currently on the market. Or let me know what kind of property you’re looking for and I can research homes in Summit County that meet your needs. You can contact me at your convenience any time. Just send me an email at [email protected] or call my office lines. I would love to be of assistance with all of your real estate questions and help you find a home in Summit County that’s right for you.